Green peas pulao is a simplest one pot meal. Delicious pulao with very less ingredients without chillies. It is just peas blended with the spice of shahi jeera, clove and red rice used to make it fibrous and nutritious. Red rice that has not been through the process of grinding or flaking skin completely so the layer of skin that surrounds the grain still exists. This is the layer which is rich in nutrients and fiber. Green peas are rich source of antioxidants and add fresh flavour and hearty texture to the dishes. This rice can be enjoyed far breakfast or for lunch with goes very well with gravies. Boil enough water (about 4-5cups) in a saucepan add drained rice and cook for 12-15mins. Once cooked drain and let it cool completely. Heat butter in a pan add cumin seeds as it splutters add clove, bay leaf saute for few seconds. Add peas , salt and saute until the peas are well cooked. Then add cooked rice and mix well. Serve hot with dal makhni/ any gravy. Can replace shahi jeera with regular cumin seeds..
You can use white rice/any rice instead of red rice. Posted on August 20, 2014, in Indian, Main dish and tagged Chitras healthy kitchen, drchdietfood, Healthy rice Pulao recipe, Red rice recipes. Bookmark the permalink. 27 Comments. This looks so yummy! I cannot wait to try it out. Thanks so much for all your hard work! 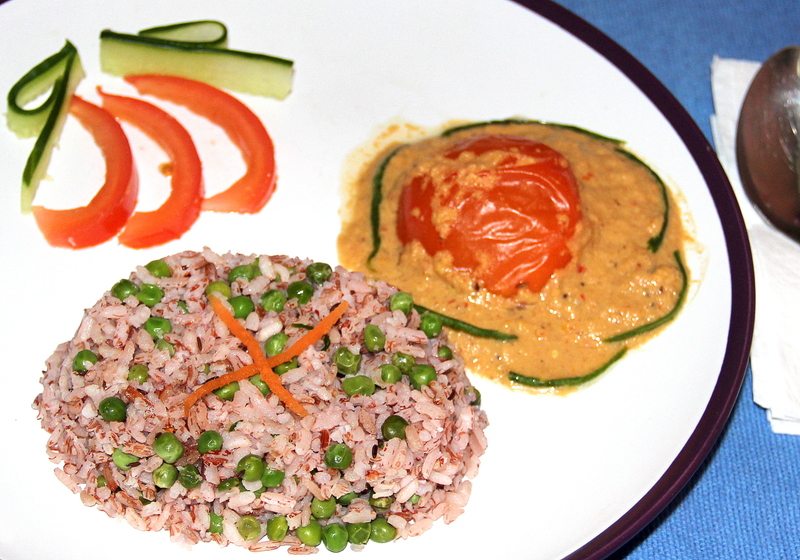 I started exploring different varieties these days Sri as bored with only brown rice all the time….. I love red rice, love this dish. Rice and peas are such a great combination. Ya there are 2-3 kind of red rice one kind which I previously used took bit longer time to cook than thus one so it depends on the type of rice as well but I felt red rice tastes delicious than brown rice. …thanx a bunch Malar. ..wait to hear from you…. I will be looking out for this red rice in my next grocery shopping !! Pulao with Red rice…!New to me!Looks nice! Oh yes.. my nani use to make the red rice and it use to be so delicious.. Friend – you made to include link to Makhani..I’ve included it…..
Thanx Sophia for your lovely feedback….